We preview the latest exhibition at the Wellcome Collection. This week sees the opening of the second part of a year-long exploration into human consciousness at the Wellcome Collection, on Euston Road in London. ‘States of Mind: Tracing the Edges of Consciousness’ promises to examine ‘the universal, yet mysterious, topic of conscious experience’. The exhibition brings together artists, psychologists, philosophers and neuroscientists to investigate the terrain between consciousness and unconsciousness. It will feature historical material, objects, artworks and an evolving programme of contemporary art installations. Following on from Ann Veronica Janssens’ disorientating mist installation ‘yellowbluepink’ which probed the nature of individual perception, ‘States of Mind’ further questions the reliability of our inner world and subjective experience. The show explores phenomena such as synaesthesia, sleepwalking, memory loss and anaesthesia, and examines what happens when our conscious experience is undermined through dysfunctional experiences of perception or through loss of consciousness. The first of four sections, ‘SCIENCE | SOUL’, takes as its starting point key moments in the historical emergence of the field of neuroscience. The pervasive idea of ‘dualism’, the separation of mind and body first formally outlined by Rene Descartes in the 17th century, is illustrated by works such as ‘The Soul hovering over the Body reluctantly parting with Life’ by Luigi Schiavonetti, after William Blake. Philosophers and scientists have long tried to define how these two worlds interact and explain how an objective brain can produce the subjective experience of consciousness. The papers of Francis Crick show that he worked on this ‘hard problem’ until the day he died in 2004, and his notes are displayed alongside neuron drawings by Santiago Ramón y Cajal, arguably the founder of neuroscience. This section also explores synaesthesia, including author Vladimir Nabokov’s experience of seeing letters as colours. The spaces between sleep and wakefulness, as well as phenomena such as somnambulism, mesmerism and sleep paralysis, are explored in ‘SLEEP | AWAKE’. This section includes archive material from the first trial where ‘insanity of sleep’ was successfully used as a defence, as well as footage from The Cabinet of Dr Caligari, a 1920 film about a man who is controlled while asleep. The experience of sleep paralysis, where sleepers are mentally awake but the body remains unable to move, is reflected in a preparatory drawing for Henry Fuseli’s 1781 painting, The Nightmare, a work that has formed the basis for many other depictions of this phenomenon, and Carla Mackinnon’s immersive installation Squeezed by the shadows. The development of language in childhood is closely linked to the recognition of a sense of self. In ‘LANGUAGE | MEMORY’, artist Louise K. Wilson invites visitors to participate in her research into autobiographical memory, pieces from Alasdair Hopwood’s False Memory Archive question the reliability of recollections and Mary Kelly’s Post-Partum Document is a series of drawings charting her changing relationship with her son as he begins to develop speech. ‘BEING | NOT BEING’ further explores what happens when consciousness is disordered, following injury or trauma. fMRI scans of patients in persistent vegetative, or minimally conscious, states have been shown to reveal imaginative activity, and this section explores the implications and ethical debates surrounding the care, rehabilitation and end-of-life wishes of these individuals. This section also looks at anaesthesia, a state of reversible coma and the closest we get to brain stem death, with a film by Aya Ben Ron, Still Under Treatment (2005), showing the moments in which patients fall unconscious under general anaesthetic. A changing programme of installations linked to language and memory begins with A Whisper Heard – artist Imogen Stidworthy contrasts the language acquisition of a young child with that of a stroke patient with aphasia, using their responses to a passage from ‘Journey to the Centre of the Earth’ to explore concepts of language, meaning and identity. H.M.’, beginning on 26 April, is a film by Kerry Tribe previously shown at MOMA, which uses two synchronised reels of footage with a 20 second delay between them to reflect the experience of Henry Gustav Molaison, better known as ‘Patient H.M', whose case radically advanced our understanding of memory. Finally, Shona Illingworth explores the impact of amnesia and the erasure of individual and cultural memory with work from her Lesions in the Landscape project which examines personal experience of memory loss in one woman alongside the sudden evacuation of the island of St Kilda in the 1930s. 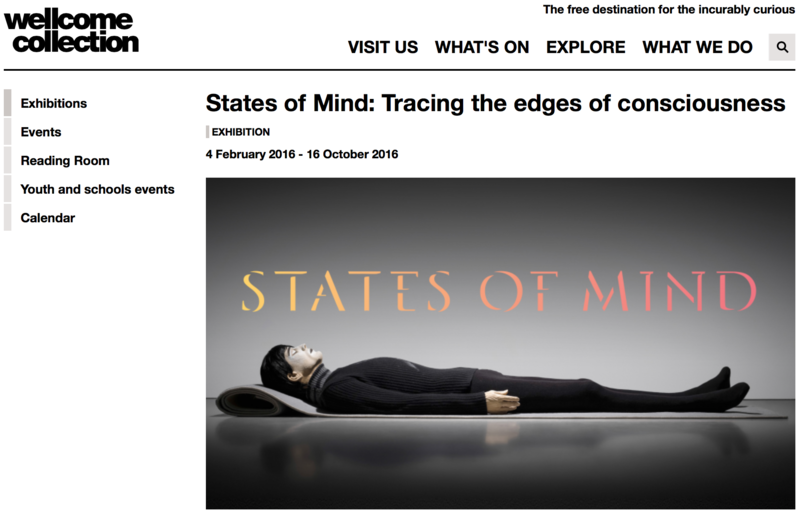 States of Mind: Tracing the Edges of Consciousness runs from 4 February to 16 October 2016. - See also our review of ‘Tibet’s Secret Temple’ https://thepsychologist.bps.org.uk/blissful-wander-through-body-and-brain and look out for more on the States of Mind exhibition in The Psychologist.